It’s the most wonderful time of the year—unless you’re a student. Let’s be honest, most students are in survival mode at this point of the semester. There are tests to be taken, papers to be written, and assignments to be submitted. This time between Thanksgiving and Christmas can be one of the most stressful periods for any student, including seminary students. For students graduating this semester, the pressure can be even greater. They are looking for ministry positions and considering housing options after they move off campus. They may even be praying that a professor or two will overlook a few errors in their final papers. Beyond the stress of the end of the semester, I have also seen seminary students and graduates struggle with post-seminary survival. Recently I overheard a handful of former students talking about being survivors of seminary and how difficult it was to listen to a sermon, study the Bible, and enjoy fellowship after spending years in the formal academic setting of seminary. I understand what these former students are talking about, but I also want to offer some tips for thriving after seminary that I learned during my ten years as a seminary student (yes, I said ten years) and more than a decade of teaching seminary. Be humble. I was one of those first year seminary students. You’ve seen them. They are the ones carrying a Greek New Testament to church and pretending to follow along in the text as the pastor preaches. Honestly, I was pretty good at Greek. I could translate from most passages on the fly by the end of my first year of seminary (second year of Greek), but if I got asked to read aloud in Sunday School, it might get ugly. Or if the pastor was preaching from the Old Testament, I was in trouble. Here’s deal… whether it is Greek, Hebrew, theology, or hermeneutics, seminary provides an unmatched opportunity to delve into the formal study of Scripture, but completing a few semesters of a subject does not make you an expert. When I watch some of my faculty colleagues who teach Greek or Hebrew follow along in chapel with a Bible in the original languages, I know that they have years of continued study and training beyond the basic 2-4 semesters of a language. I also know they are spending hours on their own refining their craft of translation. Even in my own field, I am constantly reading books and articles related to ethics just to stay abreast of current thought. The people in your church will be grateful for the time spent in seminary and the education you have received, but that little old lady who has been faithfully studying her Bible for the last 70 years may actually know more than you do. Be humble about your education. You still have a lifetime of learning ahead of you. Study the Bible for your personal discipleship. It is really easy to allow the formal academic study of Scripture to replace personal study and discipleship. A good friend of mine from college went to a different seminary a couple years before I did. I will never forget when he told me a story about one of his professors. He was overwhelmed with the volume of reading required in his classes so he sought out one of his professors for advice. He wanted to know how to devote time to his own devotional study of the Bible when so much was required of him already. Unfortunately, his professor gave him terrible advice. He said that there will be time for devotional study when you graduate. I think many students who lose their passion for God’s Word while in seminary do so because they forsake the study of Scripture for personal discipleship. Academic study is good and necessary, but it is not the end. Personal holiness and devotion to the Lord are more important than grades. If you are having difficulty maintaining a personal time of devotion, then schedule it just like you do for your classes. Stop being critical. After a year or so of seminary, it became difficult to listen to sermons. I paid attention in chapel and church, but mainly for the purpose of catching an exegetical fallacy or theological error. Then something very helpful happened to me—I took a preaching class. My professor required us to preach in class and receive feedback from our classmates. Most of my classmates were kind to me and only minimally critical. Then my professor required us to watch videos of our own preaching. Ouch! I was bad. I wanted to be the next Adrian Rogers, my childhood pastor. Instead I was just a cheap imitation in an ill-fitting suit. Watching myself preach was a humbling experience. I still don’t like to do it because I feel that I have so far yet to go. Will the pastors you listen to make errors along the way? Sure. Are your sermons perfect? Not a chance. In fact, those faithful but unknown pastors who put their time and study in faithfully each week will likely have a deeper impact on their people than the celebrity preachers on your podcast list. Stop being critical and start reflecting on how you can faithfully feed your people. Invest in the ministry of a local church. At least once a semester in seminary I heard Paige Patterson say that he prayed our first church would be filled with the type of members we were while seminary students. There was often an audible silence after that statement. Thankfully, I heeded his advice. I joined the choir, served as a deacon, taught Sunday School, went on mission trips, and even volunteered in the nursery occasionally. None of these roles were paid positions. Even today I volunteer as a deacon, choir member, children’s Sunday School teacher, and other roles. In those roles, I’m not Dr. Lenow. My students on Sunday call me Mr. Evan. In the choir loft, I’m just one of the guys in the bass section. It’s refreshing, and it’s healthy for my spiritual life. Share the gospel. Sharing the gospel is a key aspect of the Christian life. We don’t do it to get another jewel in our crown, but we do it because we care about the souls of other people. When I share the gospel, I realize a few things. Most people truly interested in hearing the gospel don’t really care about theodicy, eschatology, or hermeneutics. They want to hear the life-changing message of salvation. Sure, those other doctrines may become important later, but right now the most important thing is for them to hear a clear articulation of the gospel in the style of 1 Corinthians 15:3-4. If you can’t share the message of the gospel in a clear, straightforward fashion, it’s time to get some practice. My desire is for this graduating class of seminarians to thrive after they graduate. I don’t want them to look back on these years as some from which they need to recover. These five tips are not a magic solution to some of the difficulties of life after seminary, but they should help ease the transition. This fall, we are entering our fifth year of homeschooling. Our third child will start kindergarten, so we will officially have more children in school than not. Over the last few years, I have learned many things about my children’s learning styles, temperaments, and intellect. However, in the same way, I have learned a great amount about who I am and how God created me. As a mom who teaches my children at home, I have come to understand that it is vital for me to know who I am and be content in who God created me to be. If you are familiar with “The Four Temperaments,” I am a sanguine. As such, I like to make the home fun. I can handle any disaster with humor and a good dance session. However, I struggle with hyper-organization. Oftentimes, my children have an easier time of staying on schedule than I do. Embracing these observations in myself and diligently not comparing myself to others of different personalities has given me the freedom to run my house in a way that works for us and accomplishes God’s purposes at the same time. These are a few tips that I have begun to use that make homeschooling work for us. We have a rhythm, not a schedule. As I mentioned before, firm day-to-day schedules overwhelm me. Therefore, my family functions on a rhythm. We all get up at the same time, get dressed, eat breakfast, and then start school. My benchmark for this is 9:00 a.m. It is my goal to transition from household duties into our school day by this time. Once our school day gets started, each of my kids has a different order in which to do their work. This allows me to work with each of the children one-on-one at various times of the morning. Again, the most important concept to me is not that we stay within the exact time frame, but that the children know, once they finish a certain task, it is time for the next. At 10:30, we all take a break. They play outside while I usually switch the laundry from washer to dryer or something exciting like that. I have found that I do better when I can see tangible accomplishments throughout the day. So in the midst of working on reading with my first grader (a more long-term task), I feel accomplished because I completed a load of laundry. After break, we come back together for more schooling. We break again at lunch, and then the older children finish whatever schoolwork they haven’t already completed. They also practice their musical instruments or play sports. Therefore, a specific time might look different each day, but there is a rhythm that stays the same. Everyone has time alone and time in a group every day. Just like me, my kids all have different temperaments. For my introverts, they need to work with others in the room. However, they also need time alone to refocus and recharge. For my extroverts, they need to understand the benefit of quiet and alone time as well as enjoy the fun of everyone being together. My youngest, at age 2, is already a definite extrovert. It is hard for her to be by herself. However, last year, I carved out 30 minutes on every homeschool day for her to practice playing by herself. She did not like it, but it benefited everyone. Even I take a time out after lunch to have my quiet and Bible study time. I put my little ones down to nap, my older children begin their school work again, and I grab a cup of coffee, and sit down with God. It takes all kinds to make the world go around. Some of my kids excel at academics, some don’t. Some work well in groups, some don’t. Some thrive on schedule and organization; some (like me) are more creative and relaxed. After four years of homeschooling, this idea has become paramount: We are different, but we are good for each other. Oftentimes I wish I was more detailed-oriented or naturally organized. But God reminds me that He created me for a purpose. I can encourage my daughter who is very task oriented to notice people more and consider their feelings. However, she is good for me and helps me stay on task and inspires me to work on ways to improve my organization skills. This training in the home is very applicable in the world. In the church or in the workplace, we will encounter different personality types. In each situation, we can appreciate each of our strengths and learn from each other to improve on our weaknesses. Maybe you can identify with some of the lessons I have learned in the last four years. Have you been trying to be someone you are not in your homeschooling? Have you accepted your kids for who they are, complete with the personalities God gave them? After these first years of homeschooling, there are still areas where I want to improve, but the lessons God has taught me about myself have been priceless. How does an anti-bullying program lead to role-playing homosexual behavior? According to Paul Hooks, superintendent of the Red Hook Central School District, the program addressed “improving culture, relationships, communication and self-perceptions.” Specifically, the presentation was intended to draw attention to discrimination against homosexual students. The scary part of it all is that parents were not informed in advance about the homosexual role-playing and were not given the opportunity to opt the children out of participation. While bullying is certainly not acceptable in any context, the role-playing forced upon the students creates a bullying of a different type. For those students who had convictions against homosexual behavior, their convictions were implicitly labeled as bullying. Thus, students were bullied into believing their personal, faith-based convictions were discriminatory. By contrast, the homosexual agenda in the program was to normalize homosexual behavior. The quest to normalize homosexual behavior is alive and well in the public school system, and this is just the latest example. Todd Starnes, “Middle School Anti-Bullying Lesson Includes Lesbian Role Play,” Fox News, April 18, 2013. Jessica Chasmar, “Girls instructed to role-play lesbian relationship in workshop at N.Y. middle school,” Washington Times, April 25, 2013. I just got a new book in the mail today, and I am looking forward to reading it. 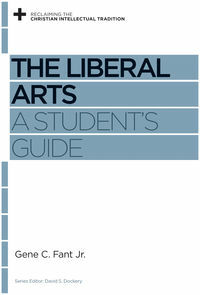 The Liberal Arts: A Student’s Guide by Gene C. Fant Jr. just came out from Crossway. Gene Fant was my British Literature professor at Mississippi College and has continued to have a huge influence on my life as a friend and mentor. He currently teaches literature and serves as VP for Academic Administration at Union University in Jackson, TN. I hope to give some thoughts on the book when I have an opportunity to read it. The book is available on Amazon and other retailers.